Kenny Rogers and Dolly Parton (pictured in 2006 and 1983 respectively) topped the chart with "Islands in the Stream", which also reached number one on the Billboard Hot 100 and was named the greatest country duet of all time by CMT in 2005. Hot Country Songs is a chart that ranks the top-performing country music songs in the United States, published by Billboard magazine. In 1983, 50 different releases topped the chart, then published under the title Hot Country Singles, in 52 issues of the magazine, based on playlists submitted by country music radio stations and sales reports submitted by stores. 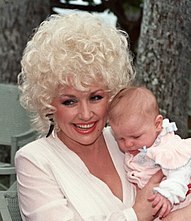 One of only two singles to spend more than one week at number one in 1983 was "Islands in the Stream", a collaboration between two of country's leading solo singers, Kenny Rogers and Dolly Parton. The song was a considerable crossover success, also topping the Adult Contemporary chart and reaching number one on the all-genres Billboard Hot 100. In 2005 the song topped a poll run by country music television channel CMT of the best country duets of all time. The only other multi-week number one was "Houston (Means I'm One Day Closer to You)" by Larry Gatlin and the Gatlin Brothers, which ended the year in the top spot. Five acts tied for the most number ones of the year, with three each, including Alabama, Crystal Gayle and John Anderson. Mickey Gilley achieved two solo number ones and also teamed with Charly McClain on the chart-topping duet "Paradise Tonight" and Merle Haggard similarly gained two solo number ones and spent a week at the top with "Pancho and Lefty", a collaboration with Willie Nelson. In addition to the artists who achieved three number ones, Kenny Rogers also spent three weeks at the top, as his two weeks in collaboration with Dolly Parton followed a week spent at number one with "We've Got Tonight", a duet with Sheena Easton. Male-female duets had long been a staple of country music, and a fourth such song to top the Hot Country chart in 1983 was "Faking Love" by T. G. Sheppard and Karen Brooks. In January Reba McEntire topped the chart for the first time with "Can't Even Get the Blues". McEntire would go on to become one of the most successful female singers in country music history, topping the chart regularly for nearly three decades; in 2011 she achieved her 25th number one song, tying with Dolly Parton for the most chart-topping songs by a female artist. While McEntire began a decades-long run of number ones in 1983, several veteran singers added to their extensive tallies of chart-toppers during the year; Merle Haggard's three number ones took his career total to 32 spanning 17 years, and Ronnie Milsap continued a run of number ones which had begun in 1974 and included 13 appearances in the top spot between 1980 and 1984. 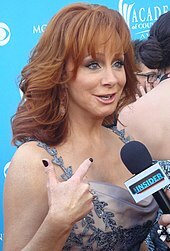 Reba McEntire (pictured in 2010) had the first number one of her career in 1983. She would continue to be a regular chart-topper into the 21st century. John Anderson (pictured in 2008) had three number ones in 1983. Larry Gatlin (pictured in 2009) and the Gatlin Brothers ended the year at number one. B. J. Thomas (pictured in 1972) had two chart-toppers in 1983. ^ Hoffmann, Frank (2016). Chronology of American Popular Music, 1900-2000. Routledge. ISBN 9781135868857. Retrieved March 3, 2018. ^ "Flashback: Dolly Parton, Kenny Rogers Take 'Islands in the Stream' to New Heights". Rolling Stone. October 29, 2014. Retrieved March 3, 2018. ^ Shelburne, Craig (June 9, 2005). ""Islands in the Stream" Named Greatest Country Duet". CMT. Retrieved March 3, 2018. ^ Weisbard, Eric (2014). Top 40 Democracy: The Rival Mainstreams of American Music. University of Chicago Press. p. 84. ISBN 9780226896182. ^ Shelburne, Craig (July 30, 2004). "It's the 22nd Time at No. 1 for Reba McEntire". CMT. Retrieved March 2, 2018. ^ Thompson, Gayle; Stefano, Angela. "Story Behind the Song: Reba McEntire, 'Turn On the Radio'". The Boot. Townsquare Media. Retrieved October 31, 2017. ^ Tamburin, Adam (April 6, 2016). "See Merle Haggard's 38 No. 1 hits". The Tennessean. Retrieved March 2, 2018. ^ Erlewine, Stephen Thomas. "Ronnie Milsap Biography & History". AllMusic. Retrieved March 22, 2019. ^ "Hot Country Songs chart for January 1, 1983". Billboard. Retrieved March 3, 2018. ^ "Hot Country Songs chart for January 1, 1983". Billboard. Retrieved March 4, 2018. ^ "Hot Country Songs chart for January 15, 1983". Billboard. Retrieved March 4, 2018. ^ "Hot Country Songs chart for January 22, 1983". Billboard. Retrieved March 4, 2018. ^ "Hot Country Songs chart for January 29, 1983". Billboard. Retrieved March 4, 2018. ^ "Hot Country Songs chart for February 5, 1983". Billboard. Retrieved March 4, 2018. ^ "Hot Country Songs chart for February 12, 1983". Billboard. Retrieved March 4, 2018. ^ "Hot Country Songs chart for February 19, 1983". Billboard. Retrieved March 4, 2018. ^ "Hot Country Songs chart for February 26, 1983". Billboard. Retrieved March 4, 2018. ^ "Hot Country Songs chart for March 5, 1983". Billboard. Retrieved March 4, 2018. ^ "Hot Country Songs chart for March 12, 1983". Billboard. Retrieved March 4, 2018. ^ "Hot Country Songs chart for March 19, 1983". Billboard. Retrieved March 4, 2018. ^ "Hot Country Songs chart for March 26, 1983". Billboard. Retrieved March 4, 2018. ^ "Hot Country Songs chart for April 2, 1983". Billboard. Retrieved March 4, 2018. ^ "Hot Country Songs chart for April 9, 1983". Billboard. Retrieved March 4, 2018. ^ "Hot Country Songs chart for April 16, 1983". Billboard. Retrieved March 4, 2018. ^ "Hot Country Songs chart for April 23, 1983". Billboard. Retrieved March 4, 2018. ^ "Hot Country Songs chart for April 30, 1983". Billboard. Retrieved March 4, 2018. ^ "Hot Country Songs chart for May 7, 1983". Billboard. Retrieved March 4, 2018. ^ "Hot Country Songs chart for May 14, 1983". Billboard. Retrieved March 4, 2018. ^ "Hot Country Songs chart for May 21, 1983". Billboard. Retrieved March 4, 2018. ^ "Hot Country Songs chart for May 28, 1983". Billboard. Retrieved March 4, 2018. ^ "Hot Country Songs chart for June 4, 1983". Billboard. Retrieved March 4, 2018. ^ "Hot Country Songs chart for June 11, 1983". Billboard. Retrieved March 4, 2018. ^ "Hot Country Songs chart for June 18, 1983". Billboard. Retrieved March 4, 2018. ^ "Hot Country Songs chart for June 25, 1983". Billboard. Retrieved March 4, 2018. ^ "Hot Country Songs chart for July 2, 1983". Billboard. Retrieved March 4, 2018. ^ "Hot Country Songs chart for July 9, 1983". Billboard. Retrieved March 4, 2018. ^ "Hot Country Songs chart for July 16, 1983". Billboard. Retrieved March 4, 2018. ^ "Hot Country Songs chart for July 23, 1983". Billboard. Retrieved March 4, 2018. ^ "Hot Country Songs chart for July 30, 1983". Billboard. Retrieved March 4, 2018. ^ "Hot Country Songs chart for August 6, 1983". Billboard. Retrieved March 4, 2018. ^ "Hot Country Songs chart for August 13, 1983". Billboard. Retrieved March 4, 2018. ^ "Hot Country Songs chart for August 20, 1983". Billboard. Retrieved March 4, 2018. ^ "Hot Country Songs chart for August 27, 1983". Billboard. Retrieved March 4, 2018. ^ "Hot Country Songs chart for September 3, 1983". Billboard. Retrieved March 4, 2018. ^ "Hot Country Songs chart for September 10, 1983". Billboard. Retrieved March 4, 2018. ^ "Hot Country Songs chart for September 17, 1983". Billboard. Retrieved March 4, 2018. ^ "Hot Country Songs chart for September 24, 1983". Billboard. Retrieved March 4, 2018. ^ "Hot Country Songs chart for October 1, 1983". Billboard. Retrieved March 4, 2018. ^ "Hot Country Songs chart for October 8, 1983". Billboard. Retrieved March 4, 2018. ^ "Hot Country Songs chart for October 15, 1983". Billboard. Retrieved March 4, 2018. ^ "Hot Country Songs chart for October 22, 1983". Billboard. Retrieved March 4, 2018. ^ "Hot Country Songs chart for October 29, 1983". Billboard. Retrieved March 4, 2018. ^ "Hot Country Songs chart for November 5, 1983". Billboard. Retrieved March 4, 2018. ^ "Hot Country Songs chart for November 12, 1983". Billboard. Retrieved March 4, 2018. ^ "Hot Country Songs chart for November 19, 1983". Billboard. Retrieved March 4, 2018. ^ "Hot Country Songs chart for November 26, 1983". Billboard. Retrieved March 4, 2018. ^ "Hot Country Songs chart for December 3, 1983". Billboard. Retrieved March 4, 2018. ^ "Hot Country Songs chart for December 10, 1983". Billboard. Retrieved March 4, 2018. ^ "Hot Country Songs chart for December 17, 1983". Billboard. Retrieved March 4, 2018. ^ "Hot Country Songs chart for December 24, 1983". Billboard. Retrieved March 4, 2018. ^ "Hot Country Songs chart for December 31, 1983". Billboard. Retrieved March 4, 2018. This page was last edited on 26 March 2019, at 21:23 (UTC).